Brands run it. And in this new world, they want to tell meaningful stories that have a positive impact on peoples’ lives and in doing so, open a new chapter in business and humanity. In this Brand New World, business will be the curator of art. And the movie, long form and short form, will be the primary art form that both delivers immediate impact and lives in perpetuity. Brand New World Studios is the first and only company to take an organization’s greater purpose and develop and distribute that message to a worldwide audience, effectively, efficiently and dramatically. That’s the power of film in this brand new world. For the first time marketers will be able to bring their purpose to the world to inspire and guide their customers, associates and shareholders, not just sell them. Making a film and distributing it globally is an initial ten year value proposition with a return on investment in impressions, revenue and inspiration. In reality, films live nearly forever, affording organizations the ability to share their purpose with the world and connect with their customers for generations to come. Until now, commerce was focused on the life of business, but now companies will be focused on the business of life. PURPOSE POSITIVELY IMPACTS SOCIETY AND THE BOTTOM LINE. IT TURNS BRANDS INTO STANDS, ADS INTO ACTIONS. PURPOSE CREATES ALIGNMENT, ENERGY AND MOVEMENT. IT'S A FORCE THAT DRIVES YOU. IT MAKES YOU PART OF SOMETHING BIGGER. PURPOSE HELPS YOU MOVE BEYOND SUCCESS TO A SATISFACTION SO DEEP IT CAN ONLY COME FROM KNOWING THAT THE WORK YOU DO CAN/WILL CHANGE THE WORLD. TELL MEANINGFUL STORIES THAT MAKES A POSITIVE IMPACT ON PEOPLES' LIVES. ONE THOUSAND FILMS THAT MAKE THE WORLD FEEL LIKE A MILLION. CREATE PURPOSE-INSPIRED MOVIES THAT CONNECT BUSINESS TO PEOPLE. 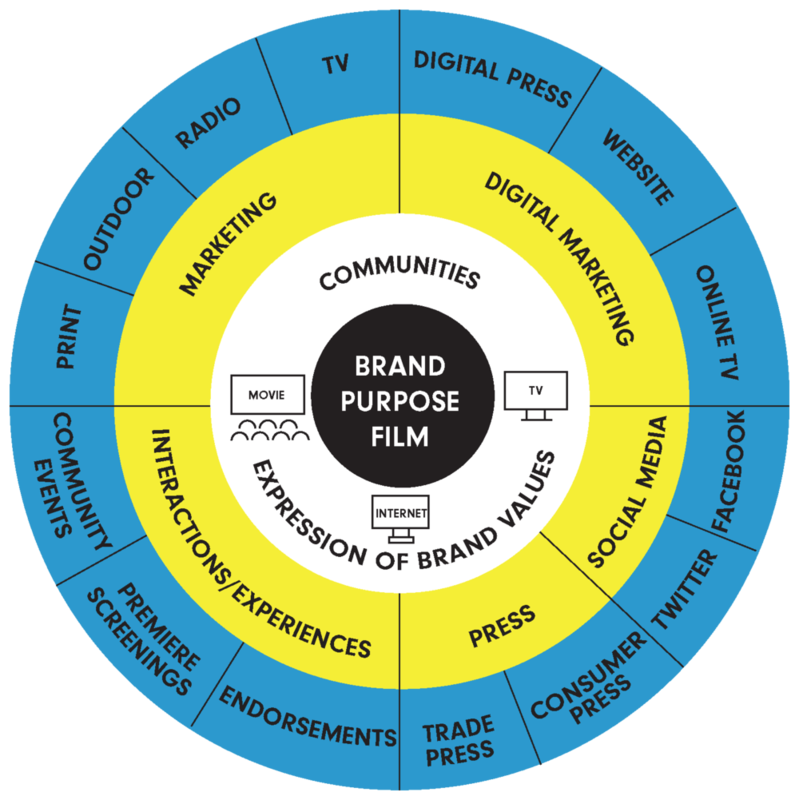 THE NEXT STEP FOR BRANDS IS TO CONNECT THEIR PURPOSE TO STORY NARRATIVE. FILM AND TELEVISION ARE THE MOST POWERFUL NARRATIVES WE MAKE. RIGHT NOW THERE IS NO MORE POPULAR AND COST EFFECTIVE MEDIA THAN FILM. FILMS LAST AND ARE DISTRIBUTED FOR A LIFETIME SO THAT GENERATIONS UPON GENERATIONS WILL SEE THEM. PURPOSE INSPIRED MOVIES ARE NOT 30 SECOND ADS. THEY ARE LIVING BRANDING PLATFORMS. THE GENERATION OF MILLENNIALS AGES 18 – 36 YEARS OLD ARE THE SAME DEMOGRAPHIC AS PAYING MOVIE GOERS. Brand New World creates films with a company’s purpose message as the story’s central theme. Brand New World films will be distributed worldwide across multiple platforms and will be watched for decades and decades. A company’s investment in a Brand New World film can be amortized over 7-10 years. In addition to the hundreds of millions impressions the film and its marketing will receive over its lifetime, companies will receive cash revenues from distribution as a return on their investment. 91% of millennials will switch from one brand to another if they believe the organization has purpose. A Brand New World film positively impacts a company’s employees, shareholders, existing customers, future customers, press/media and bottom line. Brand New World Studios founder Bradley Siegel served as President of TNT and Turner Classic Movies, which he created in 1994. He led TNT to the #1 rated basic cable network four consecutive years and the rise of the TNT Originals film franchise as the signature original programming presenter on basic cable. Among the numerous awards presented to TNT programming overseen by Mr. Siegel were Emmys®, Golden Globes, Screen Actors’ Guild, Peabody, NAACP Image and Sports Emmy Awards. Most recently, Mr. Siegel was President of TV One, responsible for overseeing and leading all business, operational and creative aspects of the network. TV One’s ratings experienced impressive growth including the #1 Cable Growth Network spot among its competitive set in his first year and posting the highest Q1 ratings in company history. The network also achieved five consecutive quarters of year-over-year gains in primetime under Siegel. Mr. Siegel was responsible for building the network’s original movie franchise, producing 26 movies, 10 were the most watched programs on all of television among black television viewers. Siegel’s last two movies for TV One became the highest rated films in the history of TV One. In addition, Siegel created an entire social and media program that garnered the #1 trending spot on Twitter and Facebook on multiple occasions. Prior to joining TV One, Mr. Siegel founded and was Vice Chairman of Atlanta based UP TV, growing the network from 2700 homes to over 70 million. Under Siegel’s leadership, UP TV original programming won and was nominated for multiple broadcast, promotion and design awards. This includes the UP TV Original Movie The Heart of Christmas, Emmy® Award nomination, and four NAACP Image Awards nominations for the UP TV Original Movies Raising Izzie and Somebody’s Child, and UP TV Original Play Sugar Mommas. Siegel was responsible for UP TV’s micro-budget movie strategy, producing 58 original movies for the network. On behalf of UP TV, Mr. Siegel partnered with Ervin “Magic” Johnson in 2012 to develop and launch ASPIRE, a television network celebrating the ground breaking achievements of African Americans. Prior to UP TV, Mr. Siegel was President of Turner Entertainment Networks for Turner Broadcasting System, Inc. (TBS, Inc.) In this capacity, he was responsible for TNT, TBS, Cartoon Network, TCM, TNT Originals, WCW, Adult Swim and Turner Studios. During the 5 years Siegel ran Turner Entertainment, the operating income increased at an average annual rate of 15%. In his last two years, EBITA exceeded $1.1 billion. Prior to joining Turner, Mr. Siegel was Vice President of Programming and Production at American Movie Classics (AMC). Mr. Siegel now joins Brand New World Studios as CEO with the purpose of creating the most meaningful storytelling company in the world. Joey Reiman is globally known as the “King of Corporate Purpose.” For the past twenty-five years, he has helped Fortune 500 companies discover, articulate and activate their company and brand purpose. Fast Company magazine named Reiman one of the 100 people who will change the way the world thinks. Reiman was founder and Chairman of the global consultancy BrightHouse, a company whose sole purpose is to bring greater purpose to the business world. The world’s most prestigious organizations have adopted Reiman’s frameworks and methodologies, which include American Express, Carlsberg, Delta Air Lines, Mercedes, McDonald’s, Procter & Gamble and SunTrust. Reiman’s best-selling book, The Story of Purpose: The Path to Creating a Brighter Brand, a Greater Company, and a Lasting Legacy follows in the tradition of his breakthrough business book, Thinking For a Living, which created a global movement celebrating the power of ideas. For over a decade, Reiman has been teaching creative and critical thinking at Emory University’s Goizueta Business School. A frequent marketing and branding guest expert on CNN, World-renowned Professor Philip Kotler calls Reiman, “The Moses of Marketing.” A pioneer in marketing and neuroscience, Reiman was named Senior Research Fellow at Emory University’s Medical School. After twenty years as BrightHouse CEO, Reiman, and his consultancy joined the Boston Consulting Group (BCG) to bring purpose for companies around the world. In 2017, Reiman was named a BCG Fellow, a title given to the most accomplished thought leaders within the company. In 2018, Reiman takes the helm as Founder and Chairman of Brand New World, the most purposeful storytelling company in the world.